This meal is simple to make following the directions carefully is the key to success. Please read about my tricks discussed above before diving into the recipe. These tricks were learned over a course of years of making this recipe. Be sure to always start with preparing your vegetables and measuring all the ingredients before you start cooking, this will ensure that you don’t forget something essential. Be sure to use a cast iron or stainless steel skillet large enough to cook all of the meats. I use cast iron when ever I can. Also use a tall and heavy stainless steel stock pot to cook everything in. I avoid using nonstick stock pots for recipes that don’t need them. It saves on their wear and also cooking food on high heat can damage nonstick ware. 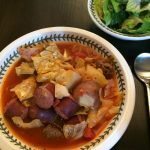 When making sausage cabbage stew it is important to sauté the meat to until the sausage and meat balls are light brown before starting. The process of browning induces a chemical reaction called the “Milliard Reaction” which basically reduces some of the meat tissues to sugars, and the sugars are what burns, and this builds color, flavor, and texture.